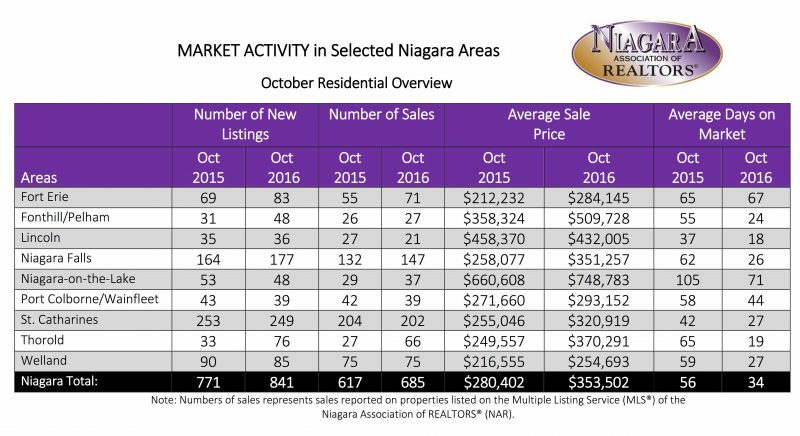 The Niagara Association of REALTORS® (NAR) reported 760 property sales processed through the NAR Multiple Listing Service (MLS®) system in October. This represents a 14.8% increase in sales over October of last year. The residential average sale price of $353,502 was 26.07% higher than last October. The average days on market decreased from 56 to 34 in the residential freehold market and decreased from 84 to 51 in the condominium market. "Prices continue to increase as inventory remains low resulting in a SELLERS MARKET" said Patrick Dummitt, President of the Niagara Association of REALTORS®.